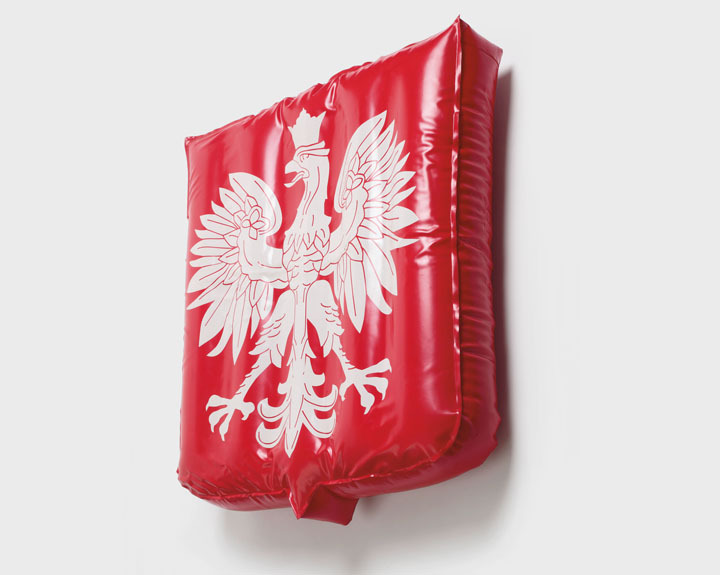 A national emblem in a form of PVC pillows, 40×35 cm big, which are filled with air. This eagle can be bought in every newsagent’s, by every supermarket cash desk, right beside newspapers, cigarettes and chewing gums. Then it can be taken home, used as a decoration, hung on a wall, serve as a simple pillow or be taken to the beach (not that by the Polish Baltic Sea) where it will bring much fun to children and elderly people. Apart form the purely functional aspect, such a gadget is a clear statement about the patriotic reasons of the owner, manifested on the occasion of everyday use of the product. “Blown up Patriotism” raises a question about the character of patriotism in the pop culture era, it shows how the modes of expression have changed in reference to some traditional values. It makes us realize that every attempt to adjust these modes to social changes will always be as accurate as confusing just because it reveals processes and changes which we were not actually aware of.